A wood deck perks up the beauty of the backyard and provides a space that can be used for various purposes like sunbathing, dining, get-togethers, parties, and so forth. 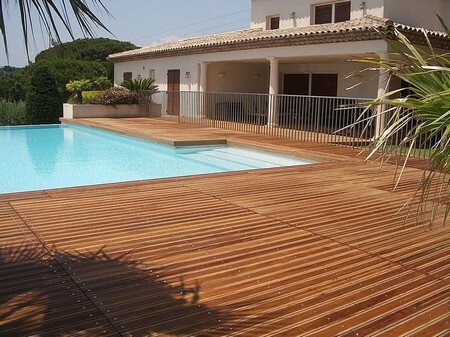 Building a wooden deck is basically a home improvement project that can be completed within a few days. 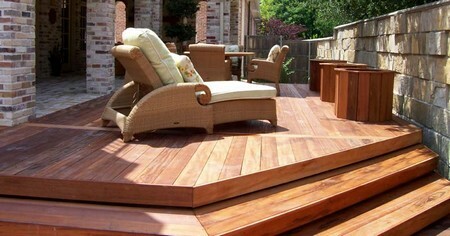 Here is a stepwise procedure to build a wood deck. The first thing that needs to be done is to take the measurement of the area where the deck has to be installed. Thereafter, start looking for the deck designs; there are innumerable places where good designs can be found as home improvement magazines, websites, brochures, leaflets, and so on. It is advisable to select an easy to make design. After the design has been selected and the deck-building plan has been devised, clean up the area where the deck will be put together. Remove the grass and level the land. Cover the cleared area with landscaping cloth to prevent the weeds and grass from growing back. The next step is to build the outer frame. 2 x 10 or 2 x 8 lumber should be used for this purpose. All the sides should be 12-foot long Once the outer frame has been made, plant the footers on the ground. First fix the posts that will be on the four corners of the frame. Use cement and dirt to ensure that the footers remain firmly fixed at their position. Pre-built posts are considered to be the best for the deck. If pre-made footers are not available, then 4 x 4 posts should be used. After the corner footers have been set, install the other posts. The distance between the posts shouldn’t be greater than 4-feet. The closer the footers are, the stronger will be the deck. Now that the posts have been affixed, start making the internal frame. The number of footers will decide the number of boards that will be needed to make the internal frame. First attach the boards to the posts in the north-south direction. Use 4-inch screws for this purpose at the rate of 3 screws per board. To make the task easy, drill holes on the board and post before tightening the screws. In all the north-south boards, carve out a notch that is 2-inches wide and 4-inches deep. In the east-west boards, create a notch that can easily slide into the notch of the north-south boards. Again use 4-inches screws to attach both the boards. With this the internal frame is ready. The next step is to lay down the floor. For 12 foot long floor, 14 or 16 foot long boards should be used. Make sure that the overhang is only on one side of the deck. After the entire floor has been laid down, precisely cut out the overhang. Finally, install readymade steps and railing to finish off the wood deck.